Pep Guardiola was able to bag his first Premier League title with Man City this season. That is, in itself, a great achievement, and the manager will be eager to continue this form into next season as well. With the title secured weeks ago, all the remaining games played were of no big significance. As of such, Guardiola’s self-proclaimed youth policy would have had an apt chance to show itself. And yet, the former Bayern Munich and Barcelona manager failed to do a particular thing that has now caught him much flak on Twitter. 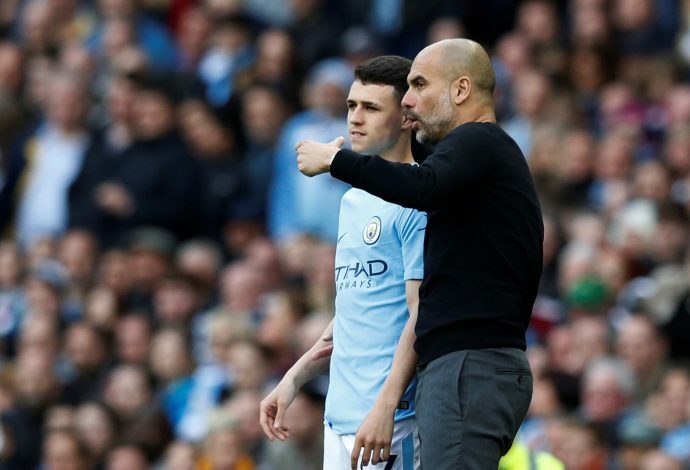 During City’s trophy-lifting home game of the season against Huddersfield, which ended in a dull 0-0, sitting on the bench was youngster Phil Foden. Now, as per the Premier League rules, in order for a player to receive a winner’s medal, he must have made a minimum of 5 league appearances. Prior to the game, the 17-year-old midfielder had 4 caps to his name, and being named on the bench led many to believe that the youngster would, in fact, be eligible for the medal by coming on by the end of the game. But instead, the great Guardiola didn’t bring him on at all, and chose Bernardo Silva as his final substitution in the 73rd minute. What would hurt even more is that the teenager was even sent out to warm-up and then let down at the last minute. Cameras panning in on his face showed utter disappointment, as anyone who is deprived of a winner’s medal of arguably Europe’s greatest League would be. Twitter took great notice of this and slammed Guardiola’s self-proclaimed youth policy. As a result, when the rest of the team is celebrating the season’s hard-work with their medals and trophies, Foden will be left without one.